Hydrangea paniculata 'HYPMAD I' or as introduced by First Editions® Hydrangea paniculata White Diamonds is a compact, hardy and sturdy deciduous shrub with dark green leathery foliage on strong upright reddish coloured stems. Its blooms glistening white on upright panicles that eventually fade to lovely parchment and pink colours. Cut flowers are great for dried arrangements. This easy-to-grow shrub is ideal for both container planting and beds and borders alike. Flowers June-July. Height 150-200cm. Supplied in a 7.5-10 litre pot. 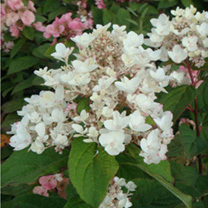 Hydrangea paniculata 'HYPMAD I' or as introduced by First Editions® Hydrangea paniculata White Diamonds is a compact, hardy and sturdy deciduous shrub with dark green leathery foliage on strong upright reddish coloured stems. Its blooms glistening white on upright panicles that eventually fade to lovely parchment and pink colours. Cut flowers are great for dried arrangements. This easy-to-grow shrub is ideal for both container planting and beds and borders alike. Flowers June-July. Height 150-200cm. Supplied in a 3 litre pot or 7.5-10 litre pot.